Use, on braided rope 10,5 and 12,5 mm diameter. Body, high strength steel, electro-zing-plated protection. 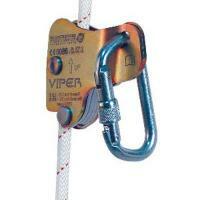 Hook, strength > 25 kN, opening 17 mm, high strength steel, white colour electro-zinc-plated protection. Net weight : 0,60 kg. Comply with standard 0086 EN 353-2.